If you are considering buying a vessel, the Marine Survey is the most crucial aspect of its purchase. Boating can be an unnecessarily tiring and expensive hobby if deficiencies in your vessel are not found before its purchase! The Marine Survey Report can help ensure safety aboard your vessel, and help with its overall ease of operation, as a result of a thorough inspection of its structural integrity and working systems. It may act as a "negotiating chip" when agreeing upon a final purchase price. Deficiencies found may be corrected, the purchase price adjusted accordingly, or both. Capt. Paul W. Shaw II checking for delamination and moisture infiltration into the rudder core. 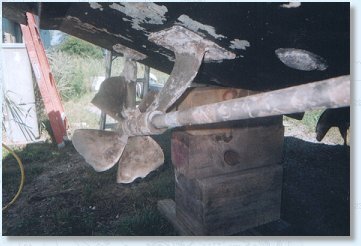 Damage evaluation of hull and running gear. As an experienced Marine Surveyor, Captain Shaw will conduct a thorough inspection of your potential purchase utilizing his extensive formal and practical education. You will be provided with a confidential Marine Survey Report accepted and respected by all major insurance and lending institutions. All items in the report will be reviewed with the requesting party, and possible plans of action/repair can be discussed. There is no additional fee for this service. In addition to the survey, our Office Manager and Marine Specialist, Joni Viola, will guide you through the sometimes confusing purchase process and provide assistance with all necessary survey preparations and procedures, including scheduling vessel haul-outs, etc. Haul-Out Scheduling ... We'll make the arrangements! Rates vary depending upon vessel size, location, and specific services requested. Please feel free to call for a quote.